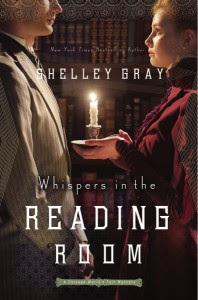 I have read a number of books by Shelley Gray, but to date, most of them have been Amish fiction. A few months back, I got the chance to read her novella An Outlaw's Heart as part of the book, Among the Fair Magnolias. So, when I saw that she had a new book coming out that was period fiction, I was excited for the opportunity to read it. Whispers in the Reading Room is set in Chicago in 1893. It turns out that it was the third in the A Chicago World's Fair Mystery series. Fortunately, there was no need to have read the earlier works to thoroughly enjoy this one. Even from the first chapter, I was drawn into the story and found myself wanting to read more. There were evenings that went a little later than planned, as I convinced myself to read just one more chapter (and then perhaps another) so that I could see what happened next. My husband even made fun of me as I attempted to read a few pages on a short car ride to lunch one afternoon. As with her other works, this story has great character development. Through the course of the story, I came to know the main characters and yet, they still managed to surprise me in their action. I frequently find passages that strike me, but rarely share them. In this case, I tabbed the corner, because it was something that I really could relate to, that feeling when you finish a book. "She still remembered the expression on his face last week when he'd finished and closed the last tome. He'd looked pleased and just a bit melancholy. She knew those dual feelings well - the satisfaction of completing a well-written piece of literature while also coming to terms with the fact that those few moments of pure bliss would soon be replaced with longing for more." I really enjoyed the book and would recommend it to those that love period history and those that love stories of mystery and love. You can learn more about the book and find other reviews on the blog tour landing page.